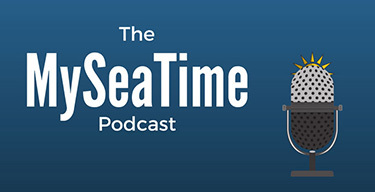 We do so many things to make sure that ship owners get the maximum out of their investments on buying and running a ship. We make sure that there are least constants on the ship, the ballast is pumped out to the last drop and many other things like these. All this to make sure that we have the capacity to load maximum cargo and ship owner has a chance to earn maximum from it. But while we do all this, sometimes we just fail to do the simpler things right. Things as simple as cargo calculations. This is something a chief officer cannot afford to do it wrong. But here is the thing. It is sometimes difficult to get a hang of these calculations. There are so many tables to use and so many terms that float. Sometimes it is difficult to understand which one to use and why. But don’t worry!!! This article would aim to simplify the cargo calculations on tankers. Before we proceed to the complex things, it is better to start with the basics. Volume changes with temperature but the weight remains the same. Even when we hear some weight of cargo, let us say 30000 Tons of cargo, there are two things that we need to be aware of. Apart from the units, weight is measured in air or in Vacuum. Even though on ships it is more common to measure the cargo weights in the air, sometimes you may find that the charterers would give the requirements for measuring weight in Vacuum. Remember, for stability and draft calculation we still would need to use the weight in air. Coming back to the topic, can you guess for the same amount of cargo which weight would be more? Weight in air or weight in Vacuum? No problems, make a wild guess even if you don’t know. Well, the weight is Vacuum is always more than the weight in Air. This is because, like with water, air (and any other medium in which the weight is present) would offer some kind of buoyancy which reduces the weight. In the vacuum, there is no buoyancy and hence the weight is more than the same weight when measured in air. Ok, so now here is the first thing that we can learn. How to convert weight in Vacuum to weight in Air? 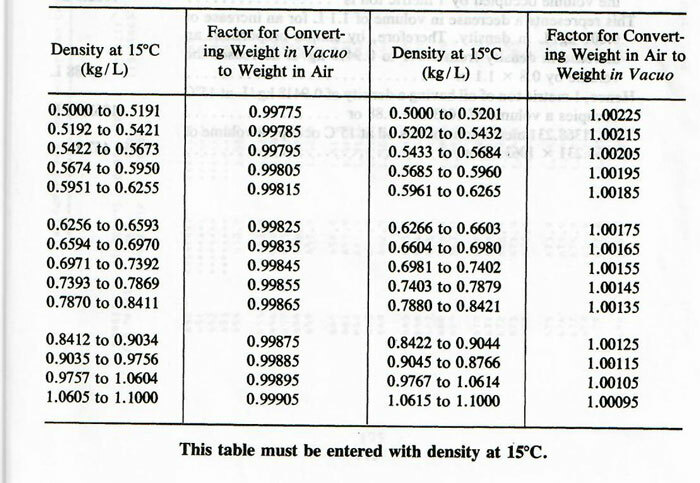 The first page of the ASTM table 56 provides the factor for converting weight in vacuum to weight in air and vice versa. Ok, now let us get back to basics of cargo calculations on tankers. And it is not that complicated. We first measure ullage (or Sounding) of the tanks by UTI tape (or radar gauge in CCR). We also measure the temperature of the cargo preferably at three levels and take the mean of these three temperatures to get the temperature of the cargo. So here is what we have. Now we get the volumes for each of these tanks for the corrected ullage that we have got. This will be the volume at the observed temperature. Remember volume changes with temperature. 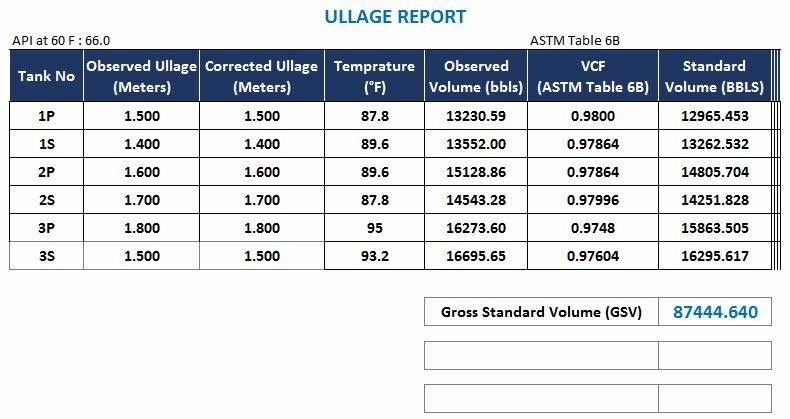 Let us say we got the volumes from the ullage tables and the volumes for each tank are as per below. As the volume changes with the temperature, this cannot be the measure of how much cargo we have loaded or discharged. We need to convert the volumes to the weight of the cargo in each tank. We need the density of the cargo to convert the volume of cargo to the weight. 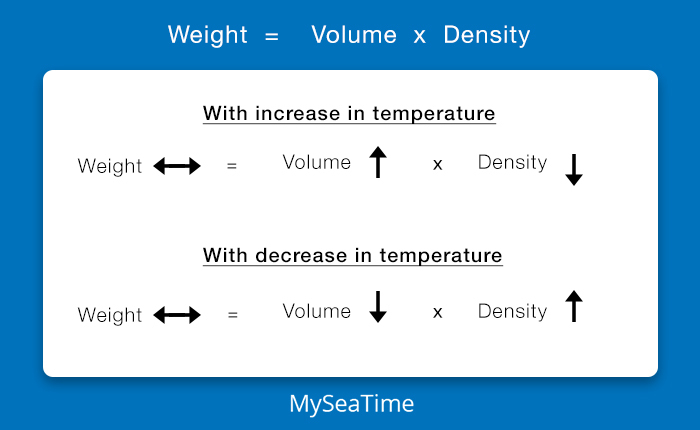 And as the density also changes with the temperature, we would need the density of the cargo at the cargo temperature to convert the observed volume to weight. If that was not enough, humans on this planet earth have managed to confuse it further. Weight is measured in Metric tons at some places and in long tons at other places and barrels at 60 deg F at other places. But don’t let all these confuse you. I won’t let you confuse yourself. Take a deep breath and read on. First, check what cargo surveyor has provided you. Let us calculate the weight of cargo in each of these situations. So let us say that cargo surveyor has provided us with the density at a particular temperature and correction factor. This means that at every degree rise in temperature, the density would decrease by 0.0006. So, in this case, we just apply these densities to get the weight of cargo in each tank and thus the total weight of the cargo. 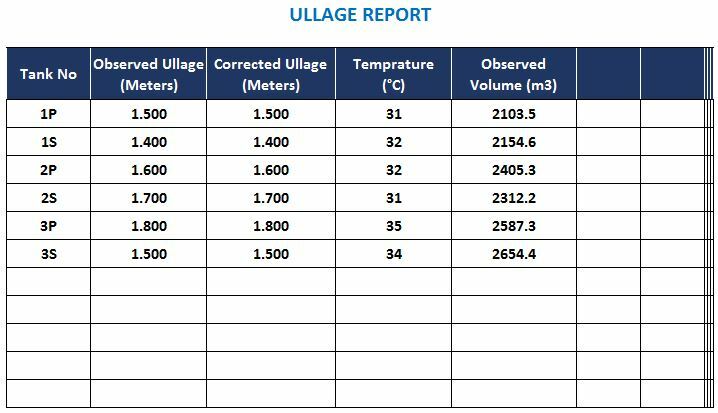 Here is how the ullage report will look like. The cargo surveyor may provide a table of densities at different temperatures. This is even easier than the previous section that we discussed. The density table could look something like this. The cargo calculations, in this case, are also easy. We just take the density of the cargo to the corresponding cargo temperature that we measured. Rest of the calculations is the same as what we discussed in the previous section. 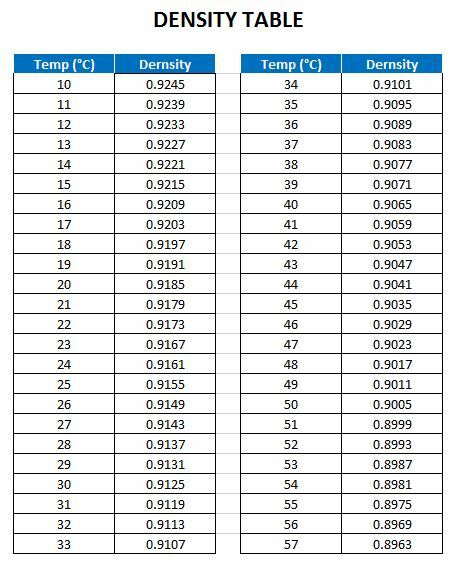 If the cargo temperature is between two values in the density table, we just interpolate to the get the density at the desired temperature. The previous two methods are useful and applicable for cargoes the density for which changes proportionally with temperature. These methods are mostly used for calculation of chemical cargoes. 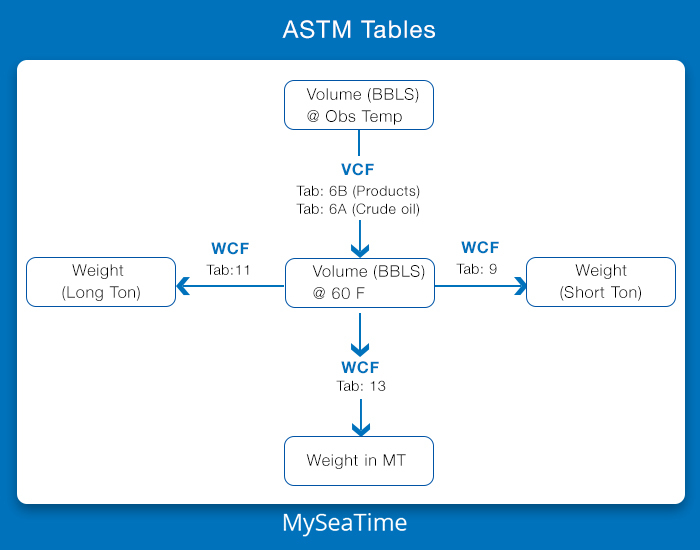 But for petroleum products and crude oils, ASTM tables are used for calculating cargo weights. 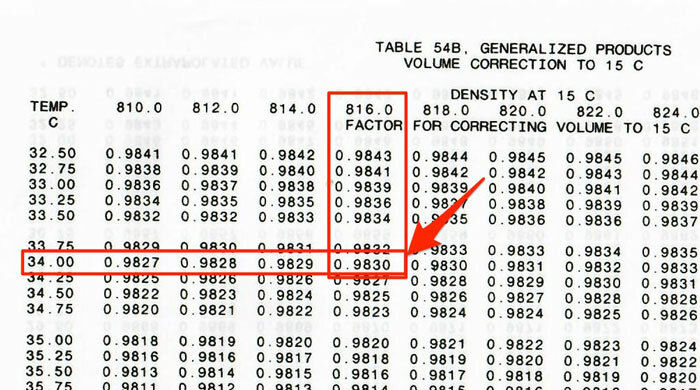 ASTM tables give the Volume correction factors (VCF) to find the volumes at temperature for which the density is given. Let us say cargo surveyor provided the density at 15 deg C as 0.816 and ASTM table 54B to be used. Let us use the same volumes and temperatures that we have used in our initial example. So first we need to find the VCF from ASTM table 54 for temperature 34 Deg C.
Go to ASTM table 54 and look under density@15 C of 816.0 and temperature 34.0 Deg C.
So as we can see for temperature 34 Deg C, the volume correction factor is 0.9830. Similarly, we need to find the VCF for cargo temperatures of other tanks. And when the VCF is applied to the volumes at observed temperature, we get the volumes at 15 Deg C which is also called “Standard Volume”. 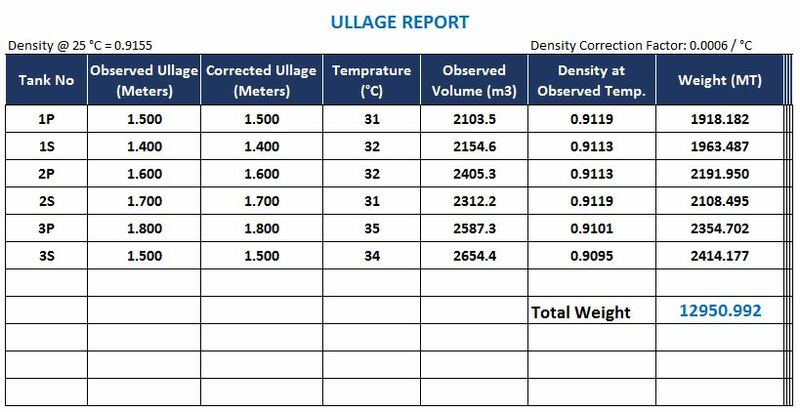 Here is how the ullage report would look like so far. Now at many places may be using the standard volume instead of weight. The standard volume of the cargo would also remain same as this is the volume at the fixed temperature (15 Deg C). But in any case, we still need the weight of the cargo as the stability calculations need the weight of the cargo in each tank and not the standard volume. Getting the weight from standard volume is simple. We have the volume at 15 Deg C and we have the density at 15 Deg C.
If we multiply these two, we get the weight by a simple formula. The density at 15 Deg C is always the density in Vacuum. So if simply multiply this density with standard volume, we get the weight in Vacuum. So we then need to either convert the weight in vacuum to weight in the air as we discussed earlier or we can simply convert the density in Vacuum to density in Air. There is a simple co-relation between density in vacuum and density in the air. And we call this as weight correction factor (WCF). So in our case, the WCF would be: 0.8149. When we apply this WCF to the standard volume, we get the weight of cargo in Air. In above ullage report, I have applied the WCF to the Gross standard volume but we can easily make one additional column and apply the WCF to the standard volume of each tank to get the weight in the air for each tank. Ports like those in the US do not use the metric system and hence do not use density. Instead these port use API gravity at 60 Deg F.
And as you might have guessed correctly, these ports also do not measure the temperature in Deg C but in Deg F.
Also, the volume is measured in Barrels and not in cubic meters. So when in these ports, we need to have the volumes in Barrels and temperature in Deg F.
This is not so difficult a task. There is a simple formula to convert these. 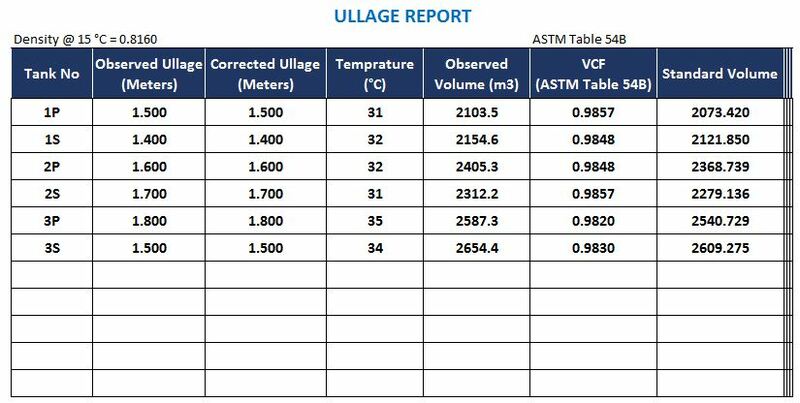 So for these ports here is what the volumes and temperatures in ullage report would look like. Following the same principle as earlier, we need to bring this volume to volume at 60 Deg F.
And to do that we need to apply the volume correction factor. We need to use a table that we can enter with provided API gravity at 60 Deg F and observed temperature in the tank to get the VCF (Volume correction factor). This the ASTM Table 6B. Let us find the VCF for temperature 95 Deg F.
As we can see from table 6B, the volume correction factor for API at 60 Deg F of 66.0 and temperature 95 Deg F is 0.9748. Of course, if the temperature or API is between the two values listed in ASTM Table 6B, we need to interpolate to get the correct VCF. Ok. So, in the same manner, we get the VCF (Volume correction factor) for other required temperatures that we have measured in each tank. And when we multiply the volume at observed temperature with VCF, we get the standard volume, this time the volume at 60 Deg F.
We need to apply Weight correction factor (WCF) to the standard volume to get the weight of the cargo. There are different ASTM tables to get the WCF for the known API at 60 Deg F.
ASTM Tabel 9: To get the WCF to convert Barrels at 60 Deg F to Short Ton in the air. ASTM Table 11: To get the WCF to convert Barrels at 60 Deg F to Long Ton in the air. 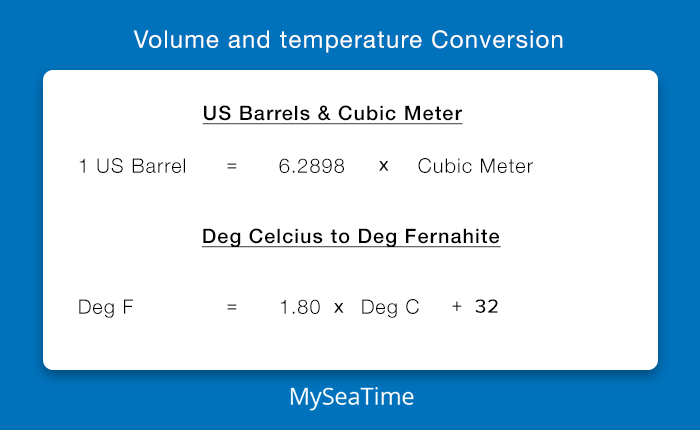 ASTM Table 13: To get the WCF to convert Barrels at 60 Deg F to Metric Ton in the air. Let us say we are interested in calculating the weight in Metric Tons in the air. In this case, we will use ASTM Table 13 to get the weight correction factor (WCF). 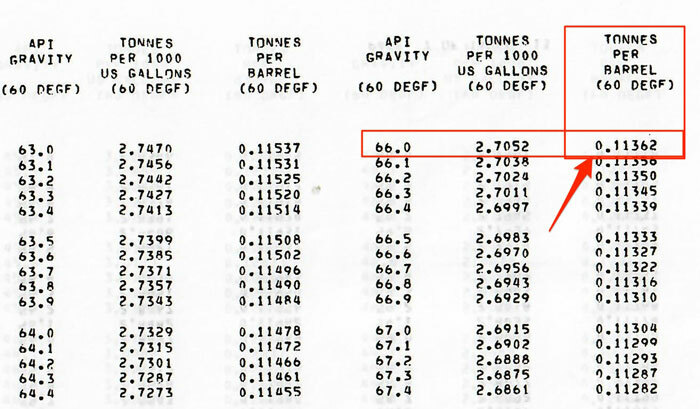 So in the ASTM table, look for the API gravity 66 and find out the WCF (which is given as Tonnes per Barrels). So as we found out the weight conversion factor for API 66 is 0.11362. We can apply this WCF to the standard volume to get the weight of cargo in the air. Now the final ullage report will look like this. So far we know that we need to use ASTM table 54 (54A for crude oils and 54B for products) for VCF and table 56 for WCF when we have been provided with density at 15 C.
And In Port like US where API gravity at 60 F is provided, we need to use ASTM Table 6 (6A for crude oils and 6B for products) for VCF. And ASTM tables 9, 11 or 13 for WCG. But there are other ASTM tables that supplement these tables that we discussed so far. 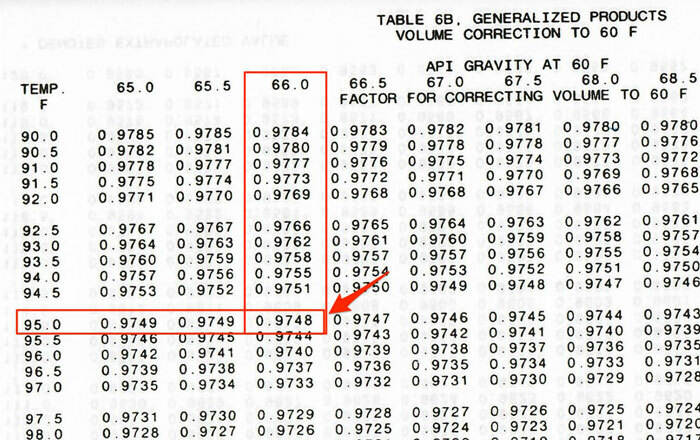 For example, to calculate the weight of the cargo with ASTM table 6 (6A or 6B), we need to have API gravity at 60F provided to us. 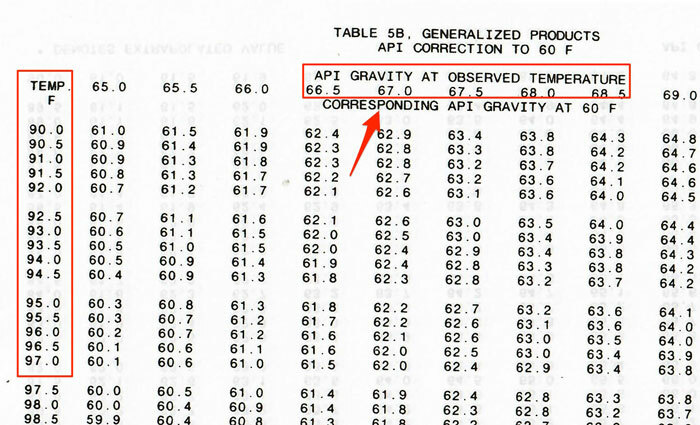 But what if we are provided with API gravity at some other temperature, say at 80 deg F? Then there is ASTM table 5 (5A for crude oils and 5B for products) that can be used to convert API at any temperature to API at 60 Deg F.
Similarly, ASTM table 53 (53A for crude oils and 53B for products) can be used to convert density at some temperature to the density at 15 Deg C. Ohh!!! And what if you load a cargo from US where API Gravity at 60 Deg F is used and to discharge this cargo at a port where they want to use Density at 15 Deg C.
Well, there is ASTM table 3 for converting API at 60 Deg F to Density at 15 Deg C.
While the ASTM tables that we discussed in previous sections are the one that is used mostly, there are other ASTM tables that supplement these main tables. And even for the main ASTM tables, the information about which table need to be used for cargo calculation is provided by cargo surveyor. 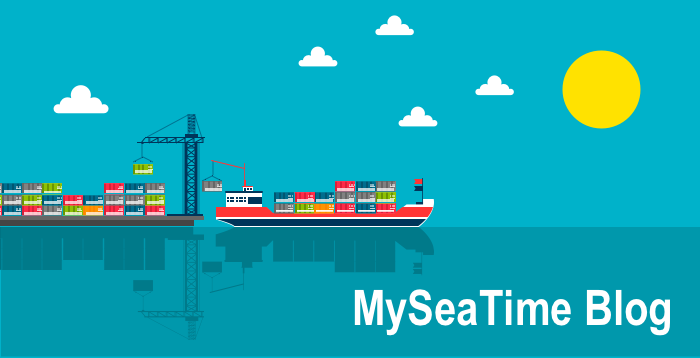 We need to follow the information provided by the cargo surveyor because that would be the table that is used for shore calculations and we need to use the same to avoid ship shore quantity difference. Cargo calculations are sometimes tricky. Not because these are difficult but because there are so many variations to it. But we need to understand that at the very basic level, we calculate the volume from ullage tables and we need to be provided with density at the same temperature as the cargo. We multiply both and we get the weight of the cargo. But for oil cargoes, we are either provided with density at 15 C or API at 60 F.
In this case, we need to get the volume correction factor (VCF) to convert the volume at the observed temperature to the standard volume which is volume at 15 Deg C or Volume at 60 F respectively. We then need to apply the weight correction factor (WCF) to convert the standard volume to weight. 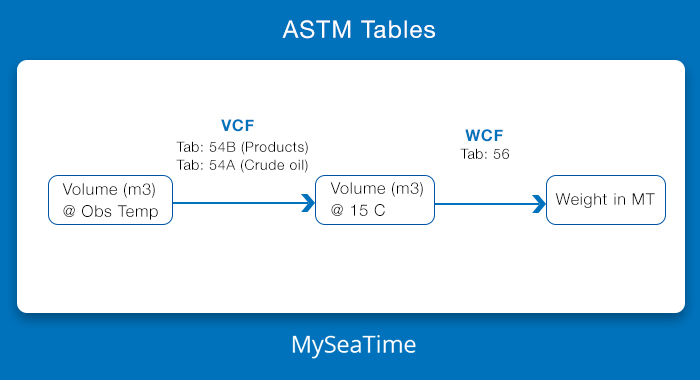 Different ASTM tables provide the value for VCF and for WCF. There are different ASTM tables for crude oil and for product oils. The one with letter A is for crude oils and the one with letter B is for product oil. ASTM tables without any letter are common for both crude oils and product oils. 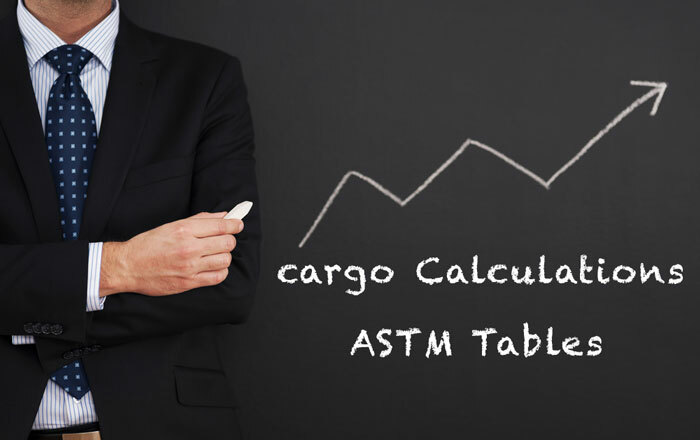 Get your hands on ASTM tables and you will find that cargo calculations are not as difficult as it seems. Great article sir. Thanks for sharing ur knowledge. More power Sir! Always waiting for more articles. Very nicely explained sir. Thank you very much for your kind effort for explaining cargo calculation in a very simple language. this information is very helpful for us master / tanker officers .. Pls next how to calculate : Vapour weight in LPG....Thanks, Capt. Rajeev Jassal. Glad you found it helful Jorge.. Will try to write on similar topic for LPG. Glad you found it useful..
first of all, thanks for the explanation . but what i wanna ask u is .. does the air buoyancy exist? it sounds silly but it's hard to understand the concept of air buoyancy . my question roots from the cargo calcualtion report from our lab . there is two different figures for the same LNG cargo, M/T(Vac), M/T(air). i thought how weight of the same cargo chage with conditions such as vac, air , other than gravity. and i read ur article and still i'm like ... really? air buoyancy?? even in the tank??? so if u don't mind , could you elaborate this part or give me some examples? Yes.. Air buoyancy do exists...It is same as how the same ship would weigh more in waters of different densities...each medium (including. Aur) offered some resistance and thus the buoyancy..
Good day Capt. Rajeev, Above well explained. Just wanted to know one thing how calculations are performed on chemical tankers. Different manufacturer may have different densities for same chemical. This is true especially for vegetable oils (Correct me if I am wrong). So how these calculations are performed on chemical tankers?? ?There are no standard tables for chemicals. For most chemicals.. the density table is provided by load port surveyor.. this density table have the densities for each degree of temperature.. the density of temperatures in decimal places is calculated by interpolations... as you right said, densities for the same chemical from different manufacturers usually change differently with change in temperatures, so we do not have anything like API tables for chemicals. Sir, when finding VCF from table 54B, the density to be used should be in Air or Vacuum? Really helpful sir, I am preparing for Ch Mates phase I exams ans as I am from a dry cargo background, this artice really helped me out. Thank you so much for sharing your knowledge in such a simple manner. Thankyou sir , very well explained in simple words with deep explanation. This is the reason "Albert Einstein Quotes. If you can't explain it simply, you don't understand it well enough"
Thanks Bharat... and that’s one of my fav quotes too.. Your work is greatly appreciated, Sir! Thanks! wish u healthy and happy! Fyi after loaded 12964.034 MT RBD Palm Olein at Belwan Port one of small tanker vessel draft F/8.90M A/8.90M and when she came at Chittagong Port made vessel trim F 8.10M Aft 9.10M but port pilotage requirement is 0.20M by stern trim. According to ullage at berth in Chittagong Port with draft F/8.10M & Aft 9.10M cargo found 12963.543 MT as same as load Port qty of 12964.034 MT. but after discharged into shore tank cargo found 12935.589MT i.e 27.954MT short than the berth ullage 12963.543 MT. Would you please comment how it can be possible to checked the shortage? There could be many reasons such as the ship’s tank not calibrated well in the delivery yards.. slight bending of the bulkheads during the age of the ship and sometimes even the shore using the density that they got after analysis of cargo received in shore tanks. Irrespective of the reasons, vessel is not concerned about how much cargo shore received. Ship goes by the figure on the ship and on any protest presented to the vessel, vessel must remark it as “for receipt only, vessel not responsible for anything beyond ship’s rail”. This Is how to explain ...god bless you sir ..everything we need to know and how to apply you have explained in such a way .thanks a lot sir thanks a lot. Fantastic. As expected, very well explained. Thank you sir for help us junior officers to further our knowledge as aspiring Chief Officers. Thanks for this knowledge and experience based article which I was searching for long time. Hope more articles on LPG and other products will be shared. Thanks once again. 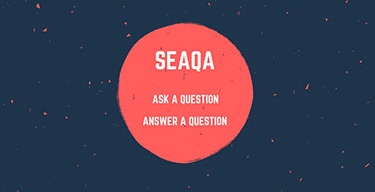 You can find information about different software for calculation of quantities for ship and shore side for Oil, LPG in Metric units and US customary units, for ship's side for LNG in metric units, for chemicals in Metric units, an oil blending program in Metric units and US customary units, a draft survey on the following websites: http://surveycalc.com and http://oilcalc.com All this software is based on the latest ASTM, ISO and API standards. Do we have to use same procedure for to calculate loadable quantity. At once we receive commence new charter. May I know what is the complete name of the book use for calculating GSV at 20degC which they are using at Brazil?